A liquid-to-liquid heat exchanger uses a heat-transfer fluid that circulates through the solar collector, absorbs heat, and then flows through a heat exchanger to transfer its heat to water in a storage tank. Heat-transfer fluids, such as antifreeze, protect the solar collector from freezing in cold weather. Liquid-to-liquid heat exchangers have either one or two barriers (single wall or double wall) between the heat-transfer fluid and the domestic water supply.A single-wall heat exchanger is a pipe or tube surrounded by a fluid. Either the fluid passing through the tubing or the fluid surrounding the tubing can be the heat-transfer fluid, while the other fluid is the potable water.Double-wall heat exchangers have two walls between the two fluids. Two walls are often used when the heat-transfer fluid is toxic, such as ethylene glycol (antifreeze). Double walls are often required as a safety measure in case of leaks, helping ensure that the antifreeze does not mix with the potable water supply. An example of a double-wall, liquid-to-liquid heat exchanger is the “wrap-around heat exchanger,” in which a tube is wrapped around and bonded to the outside of a hot water tank. The tube must be adequately insulated to reduce heat losses. 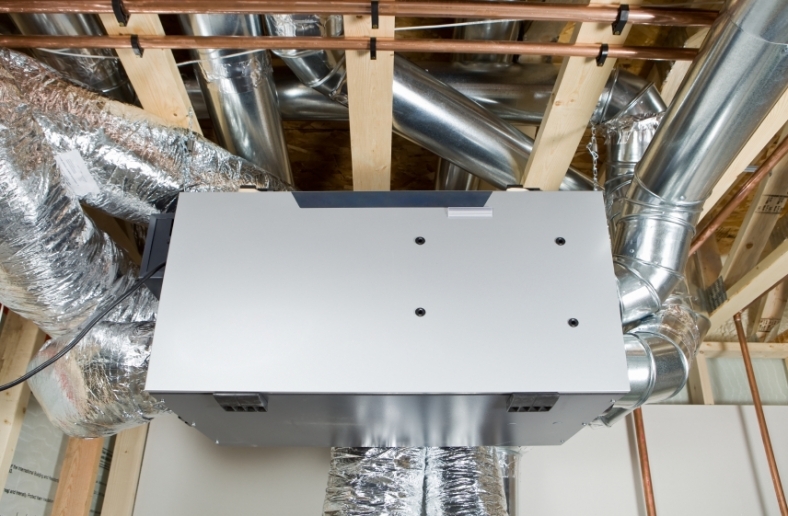 Solar heating systems with air heater collectors usually do not need a heat exchanger between the solar collector and the air distribution system. Those systems with air heater collectors that heat water use air-to-liquid heat exchangers, which are similar to liquid-to-air heat exchangers. Usually, manufacturers will supply heat transfer ratings for their heat exchangers (in Btu/hour) for various fluid temperatures and flow rates. Also, the size of a heat exchanger’s surface area affects its speed and efficiency: a large surface area transfers heat faster and more efficiently. For the best performance, always follow the manufacturer’s installation recommendations for the heat exchanger. Be sure to choose a heat-transfer fluid that is compatible with the type of heat exchanger you will be using. If you want to build your own heat exchanger, be aware that using different metals in heat exchanger construction may cause corrosion. Also, because dissimilar metals have different thermal expansion and contraction characteristics, leaks or cracks may develop. Either of these conditions may reduce the life span of your heat exchanger.